Here I am being featured on the sweet Lourdes Blog’s as a Guest Blogger ☺. I have to admit that this post turned out to be somewhat of a challenge for me as I have drawers full of makeup products!!! Like anyone that loves collecting makeup products, I tend to form a bond with all of my products so it is always somewhat difficult not to fall into the habit of constantly buying stuff!!! However, the beauty world allows for a lot of options and the truth of the matter is that I also love testing out new makeup. However, at the end of it all I keep going back to what works best for me. Lately, I have been keeping my look quite simple and natural, opting for a little bit of colour on my lips and cheeks rather than full blown eye shadows on my eyes – ya’ll know the heat we are having does not help to put you in the mood for a full on glam!!! So here goes my top and favourite 10 products – Enjoy. 1. Primer: Benefit Porefessional: This primer is AMAZING. Benefit’s The POREfessional minimises the appearance of pores. I am in love with it's silky smooth formula, feels lightweight on the skin and also it’s oil-free. The fact that it’s translucent coverage it means that it is designed to complement all skin tones. Also, on a recent trip to Rome, I learned that it also has a dual-action function that of priming as a base and touching up during the day (DOH!!). How cool is that - it can be used both under or over makeup. 2. Foundation: Clinique Beyond Perfecting: When I am not using my BB cream foundations, I love all of the foundations I own and I will continue purchasing more different ones, as I love testing out new foundations, but when I need to feel well put together, without a shadow of doubt I choose this one. 3. 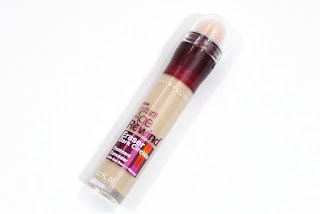 Concealer: Maybelline Instant Age Rewind : This one was an easy one considering the amount of backups I have. It's just amazing I love how it suits my skin, covers all my dark circles and imperfections! I love it's semi-matte finish, longevity and that it feels amazing on my skin. 4. Brow wax and powder: Flomar: I love using these two products as they simply go so well together! The benefits of the wax used, as a base is that it helps to intensify and shape the eyebrows easily. Product contains non-greasy Jojoba oil, which whilst moisturizing and nourishing the skin, ensures lively and healthy looking eyebrows. I apply it after I apply foundation, spooling my eyebrows into shape, let it set a bit and then apply the shadow. The shadow is great for defining my eyebrows giving them a very natural look. I love the consistency of the shadow, very nicely pigmented. It might be a bit chalky if you go in heavy handedly however nothing a tap will not solve. Ideally applied with an eyebrow brush to minimize fallout it glides nicely on, especially on the pre applied wax primer, giving you a very nice result. 5. Face Powder: RCMA No Colour Powder : If you missed my raving moment on this product, well you might want to read it first here. Highly raved from a MUA and YouTubers alike, this product is UNBELIEVABLE!! This is a NO colour powder which means there is really no colour payoff when you put this on your skin which is amazing!!! 6.Blush: Milani baked in Luminoso : The colour of this blush is everything. It has a soft, smooth texture that is a little powdery/dusty to work with, but it doesn’t dry or appear powdery once blended and buffed into the skin. The more you blend it the more luminous the finish becomes without looking overly shimmered or frosted. It's just beautiful. 7. Contouring palette: PUPA Milano: This palette is amazing, very compact, sturdy and the perfect quad for any new beginner that would like to try contouring and highlight. Highlighter is very nice, subtly illuminating powder The light contour shade is a clear and tonalized powder ideal for the centre areas of the face, underneath the eye area. Perfect for blending and to correct the gray areas. The medium contour is a slightly cool toned powder, good for toning and blending the darker shade of contouring. Whilst on the other hand the dark contour is ideal for creating that intense shadow of contouring underneath your cheekbone and temples. 8. Mascara: Flormar Precious Curl Mascara: Right off the bet, I really like how this mascara works and I also like the appearance it gives to my eyelashes. It really separates them and gives them precise definition. The wand is curved and chubby but it doesn't clump my lashes, and definitely does not stick them to each other. It's quite long lasting. 9. Liquid lipstick: Gerard Cosmetics in Iced Mocha: Quite possibly the hardest product to narrow down as I have quite a few liquid lipsticks that happen to be my favourite, however, I have to admit that the GC Iced Mocha is the one that I like mostly on me as a day, afternoon or night colour! The payoff is very intense at first application, so you must be very careful. I recommend using a lip liner before applying this but the end results is worth while. A texture Iced Mocha is quite creamy like Colourpop’s liquid lipsticks. It applies really nicely and evenly on the lips. The best part though has to be the very hydrating and comfortable wearability, almost like having nothing on the lips. 10. Setting Spray: Gerard Cosmetics Slay All Day in Lavender : I can say that I have tried and tested many different setting sprays but this one has been my go to ever since I got it. I particularly like the earthy floral scent which admittedly is slightly overpowering when you spray on the product but it does not linger for more than 5 seconds. I have been wearing this daily and I can say that it maintains my makeup perfectly :D I will definitely re-stock!